Dog Daycare is Fun, Fun, Fun! 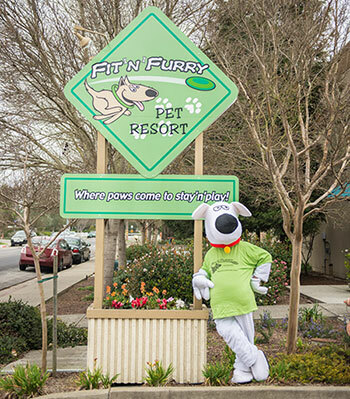 Fun is the best term to describe Fit ‘N’ Furry’s Dog Daycare program in Petaluma, CA, and that’s why our doggie daycare guests come from all over the Northern Bay area including Petaluma, San Francisco, Santa Rosa, San Rafael, Napa and the surrounding areas. Nothing satisfies a dog’s inherent pack nature more than being around other dogs, playing and interacting with the pack. At Fit ‘N’ Furry Pet Resort, our Doggie Daycare rooms are always supervised, controlled and guaranteed to be stimulating! Dogs are creatures of habit and by attending daycare on a regular basis, you are helping to create a happy, healthy, and most importantly, well-socialized canine. FREE Day of Doggie Daycare for any New Customer! Give us a call for your reservation! Discount passes (Full-day or half-day) are available for frequent visitors. Our dog daycare guests enjoy three indoor and two outdoor play areas where guests will be grouped by size, age and energy level. We provide a safe place where dogs can get exercise and attention that is vital to a thriving healthy pet--both physically and mentally. Your doggie will not be lonely while you‘re away for the day. By the time the day is over he or she will be a relaxed, exercised and happy pooch that is ready to go home and take it easy. We're convenient to all of Marin and Sonoma counties! Norman has been going to Fit ‘N’ Furry for 5 months 1-2 days a week for daycare both full and half days. He loves it there ( we can‘t say Fit ‘N’ Furry unless we‘re ready to put him in the car to go over there, otherwise he‘s a maniac). We can‘t get him out of the car fast enough and if the staff isn‘t quick enough to get him into the daycare room he commences the ear piercing barks until they do. Everyone who works there is great and we love it- never thought we would be doggie daycare people. Norman never fails to be worn out when he comes home. Buy the half or full day passes and give your dog a treat. Once a month we throw a theme party so sign up for our email list or fan us on Facebook to be notified of upcoming events. Every holiday we have a party and invite the public to bring their dog and participate! Last St. Patrick’s Day we had a St. Paddy Paws party for 35 dogs. Decorations, Irish music, bubbles (dogs love bubbles even more than kids do), individual corned beef potato based treats, washed down with a bowl of green doggie beer were enjoyed by all! Every dog couldn't help but get in the mood the second they walked in as we tied on a shamrock bandana and took a picture for mom. On the 4th of July holiday we offer a FREE evening of doggie daycare for all dogs staying with us two nights. During the evening of the bang, boom and smokey fireworks we usher the dogs to our indoor playrooms where we turn the music up loud, play games, offer treats and pass the evening away socializing! ‘Turkey Time for Canines’ No doggie felt left at Fit ‘N’ Furry Pet Resort during Thanksgiving break. The smell of roasted turkey filled the air as the flavored muttly mashed potatoes, pumpkin pup treats and dessert were being dished up for a memorable T-Day meal at FNF, gobble, gobble! Each guest also received a stuffed doggie football and a chance to watch their favorite team on TV. Give us a call to get your reservation started today!